Our pets get cuts and scrapes just like we do. You can treat the minor ones at home. However, be cautious when examining an injury on your pet. Any pet can bite when he’s in pain. If you are the closest thing to him, you are the one that will be bit, even though he doesn’t mean to hurt you. Play it safe and muzzle him or wrap him in a towel. Some signs indicate that a visit to your vet is in order. Have your pet examined whenever you aren’t quite sure what to do. If a wound is bleeding, stop the bleeding first. Apply pressure to the area with a thick cloth for a few minutes. Clean any wound or sore with warm water and mild antibacterial hand soap, but be cautious and only use the soap on the surface, it if gets under the skin it can cause irritation. Also be sure to rinse the area well. Hydrogen peroxide can be used for the first cleaning, but should not be used after that because it can slow the healing process. You can apply a very thin layer of triple antibiotic ointment, but be careful that it is not too thick as this can trap moisture. Moisture is the enemy of a wound- clean and dry is best. Wrap lightly, if needed, to keep the area protected and clean. 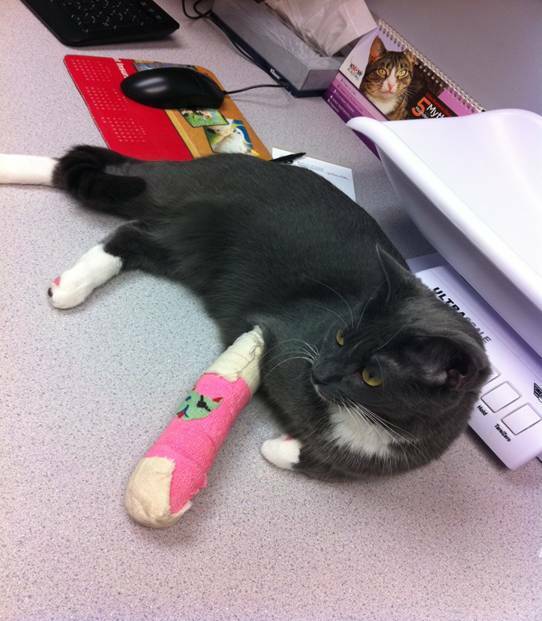 Be very cautious with any bandage you put on your pet, especially if you are using a stretchy type of material. If wrapped too tightly, it can cut off the circulation and the area below the bandage will swell up. Remove the bandage daily so you can look at the wound. Make sure any bandage stays dry. Check it whenever your pet goes outside or when a cat goes into the litter box. If it’s wet out, put a plastic bag over the bandage or wrap it with self-clinging plastic wrap. Remove the plastic when you come inside. Don’t allow your pet to lick a wound or sore. Although it is natural for them to lick it, that will slow down healing. If your pet is trying to remove a bandage, put Tabasco sauce on it, with caution because it could get in the wound. This will stop many pets, but it may make him salivate. 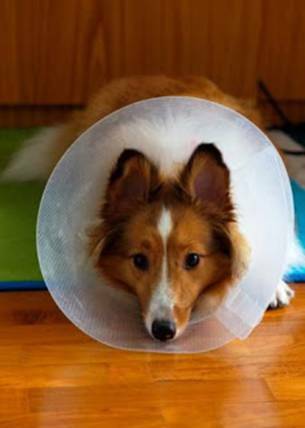 If your pet is still persistent, you will need to use an E collar. If any signs of infection develop, such as redness, swelling, heat or discharge, make an appointment with your vet. Most wounds should heal within 7 days. If that is not happening, have it examined. If your pet becomes painful or lethargic, make an appointment.